Channel 4 News presenter Jon Snow gave the annual Hugh Cudlipp lecture last night, in which he gave a powerful speech on what he views as the advent of “journalism’s golden age”. Snow has published the full version of his speech on his Snowblog, but here are some highlights from the lecture. Contrast therefore my first reporting from Uganda in 1976 and my most recent foreign assignment in 2011. That first report on the ground in Uganda dealt with the horror of Amin, it was graphic, and because I was not constrained by immediate “live” deadlines and the rest, I had time to hang about to try to grab an interview with the tyrant: that’s the upside. But I had little mechanism for developing any sense of how the story connected with the outside world – the UN, Westminster and the rest. … Contrast that with my last major foreign assignment in Cairo’s Tahrir Square where I tweeted, blogged, reported, fed the bird, and then anchored that night’s Channel 4 News live from just outside the Square. Mind you, with the pressures of time, some of the fun has gone out of it all. We are in the age of answer back, better still we are in the age in which “we the people” have their greatest opportunity ever to influence the information agenda … But above all we are in the age of more. More potential to get it right, to get it fast, to get it in depth. We have that illusive entity “the level playing field”, we can compete on equal terms and yet be the best. I think it is absolutely right that there is a regulator that people can go to. Who are we to be above the opportunity for people to review what we’ve done? Furthermore I do not want to find my own editors somewhere in the mix. I want an objective regulator. … Of course, papers and TV are entirely different beasts, and they work in entirely different ways, but I see no reason why print journalism wouldn’t benefit from a credible regulator in the same way TV has. Leveson should recommend many of the people and institutions that have been before him find a way of allowing their staff to get stuck into the real world, it will vastly improve and deepen their journalism. We journalists are not a breed a part – we must be of the world we report. The hacking scandal reveals an echelon of hacks who removed themselves from the world in which the rest of us live – they took some weird pleasure in urinating on our world. The speed and pace of what all of us is doing is starving, television journalists in particular, of the opportunity to develop the stature and presence of our forebears. These were people who had days in which to prepare their stories, dominated a tiny handful of channels, and became iconic figures in the medium. It is much, much harder for journalists today to ascend the same ladder and preside with their kind of authority and we need to afford talent the time, the space and the working experience to develop the authority that our medium depends upon. This entry was posted in Editors' pick, Events, Journalism and tagged Cudlipp lecture, Hugh Cudlipp, Jon Snow, Online Journalism, Twitter on January 24, 2012 by Rachel Bartlett. Joy is it to be alive and to be allowed the role of reporter in these amazing times. May Snowblog long continue to be somewhere where, whatever our prejudices, we can share this remarkable moment in the affairs of man and woman. This entry was posted in Editors' pick, Social media and blogging and tagged blogging, Jon Snow, snowblog on May 11, 2010 by Judith Townend. The Guardian Student Media Awards are now open to entries. The 2010 competition features a new category designed to recognise developments in digital journalism and the rise of social media. Blogs and Twitter feeds are now eligible for the ‘Digital Journalist of the Year’ category, meaning students unconnected to student newspapers or radio stations can enter. The judging panel includes Guardian editor Alan Rusbridger, Channel 4 news presenter Jon Snow, and NME editor Krissi Murison. Winners each receive a month’s work experience at the Guardian. This entry was posted in Events, Training and tagged Alan Rusbridger, andrew rawnsley, Jon Snow, krissi murison, Student Media Awards, The Guardian on March 16, 2010 by Joel Gunter. 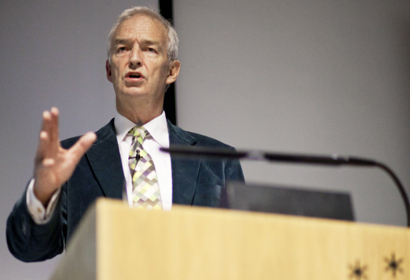 Channel 4 News front man Jon Snow spoke about the dramatically changing world of journalism that’s shaped his career and how to keep up in his inaugural lecture as visiting professor at Coventry University this week. “We’re living in a technological revolution which outstrips any industrial revolution before it,” he began – a point that underpinned his lecture, as he led the audience through the milestones of his own career and the effect of technological advances on modern journalism. Snow went on to talk about the influence of budgeting within the media, suggesting that the cost of acquiring photos and the choices that are made give us a ‘skewed view of the world we live in’. This entry was posted in Events and tagged Coventry University, Jon Snow on October 16, 2009 by Marc Johnson. Journalism.co.uk had this on its to-do list for this morning, but Sarah Ditum got there first and picked up Jon Snow’s comments from his reverse-role interview with Ann Widdecombe in the Guardian magazine on Saturday. The Channel 4 News journalist – and Widdecombe reckons this is her scoop – would welcome a privacy act and says it wouldn’t affect the tabloids too much – ‘they’re going out of business anyway’. This entry was posted in Editors' pick, Legal, Newspapers, Press freedom and ethics and tagged ann widdecombe, Jon Snow, media law, privacy law, tabloids on September 28, 2009 by Judith Townend.